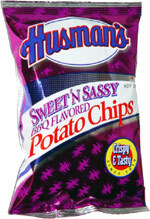 Taste test: These are excellent barbecue chips, packed with great flavor. The flavor started out very tasty and sweet, and then it turned slightly hot about a second after biting in. This began a cycle, as I grabbed for a second chip to get some sweetness to cover up the heat, then it turned hot, and I grabbed another, and so on. In the end, the more of these you eat, the stronger the aftertaste eventually becomes. The heat does linger for quite a while, and it didn't go away following a couple of swigs of apple juice. This small bag contained a decent but not huge number of chips, and almost all of them were unbroken. Great stuff! 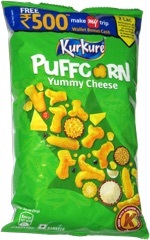 This snack was discovered by Jeremy at Riverfront Market & Deli, Convington, Kentucky. Review published .